This visual journal page is one of those quirky, fun pages that I love falling back on when inspiration just doesn’t seem to hit. I have an ongoing list of visual journal page ideas, and this one lived there for a long time before it became a reality. Sometimes it seems like inspiration is overflowing. I have too many ideas and never enough time. But what happens to all of those ideas when dry spells hit? We all have our moments of inspiration road blocks, and this page represents one of those. 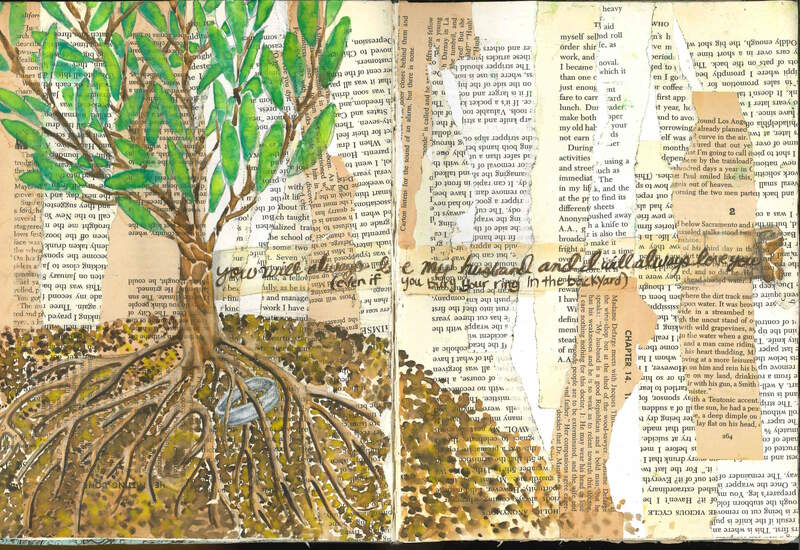 I had been steadily visually journaling about my life, all things big and small, when suddenly I had no ideas left. Nothing current seemed journal worthy and I didn’t have a vision for my bigger page ideas, but I was itching to create. That’s when I turned to my visual journal folder and ideas list. When nothing jumped out from the folder of odds and ends I had been collecting, I turned to my list. My list contains big events that have happened that I know I want to include when I have time: births of nieces, anniversaries, big trips, plus little things that don’t necessarily need to fit in a timeline: I love walking barefoot outside, red and purple skittles are my favorite combination, and whispers make my ears itch. When I had no ideas to start pages for the big events, the one that jumped off the page was the whisper one. Because although it is insignificant, it tells something about me, and reminds me of all the times my hubs has tried to catch me off guard with an ear itching whisper. Out of nowhere his hot breath is quietly telling tales of “sad Sally selling seashells at the seashore,” because sad Sally is full of high pitch, whistly, and breathy Ss. So although this is minor it does give my readers a piece of me and it gives me a memory of my husband that immediately makes the hair on the back of my neck stand up and goosebumps appear on my arms. To create this visual journal page I pushed myself outside of my comfort zone, including parts of the face in a drawing. Drawing is not my strength, and I knew it was something I needed to work on. I taught a drawing class and had many AP Art students who were drawing focus and needed help creating colored pencil portraits. I had yet to jump in, and decided this would be a good way to test out some techniques. So I wasn’t too overwhelmed, I only focused on the nose and mouth of one figure and the ear of the other. I sketched them out with pencil on a separate sheet of paper before going in with colored pencil. I started dark and moved in a circular motion to get a smoother look. As I moved from dark to light I overlapped the colors and the circles to create a more even transition from light to dark. I worked on the faces and hands simultaneously, so the skin tones would match as closely as possible. Although looking back I see a lot of issues, it looks flat, the nose and hands aren’t in proportion, the teeth aren’t realistic, at the time this felt like a big accomplishment. After completing the portraits, I cut them out, then moved on to the text. I was very happy with the way the text curled around the page in my bee sting page. So I decided to create a similar look with this. It helped add excitement, as if the words float through the air before reaching their intended destination. I wrote the words on a separate sheet of paper, then added lines and colored pencil. I cut them out and used an Xacto knife to cut out the hole in the center. To emphasize the text, I glued it to a book page I had ripped from another book, then cut it out again leaving an edge of book pages showing around the block of text. Next, I glued the portraits to the pages of my visual journal, then added the text. I overlapped the portrait on the text block, making it look like the words were coming out of the figure on the lefts mouth. I used an Xacto knife to slice an opening in the ear of the figure to the right, then slide the text block through the opening to make it look like the words were going into the figure’s ear. Create a visual journal page about one of your pet peeves. Interested in more visual journal stories, tips, and how tos? Check out my visual journal blog page here and my visual journal bundle on TPT here. Thanks for taking the time to check out my blog! Help spread the word and get involved with visual journaling by following, sharing, and commenting! Every two years my school hosts a large gala as a school fundraiser. The silent auction is a huge part of that and every gala the art department is asked to create a class project to donate to the auction. 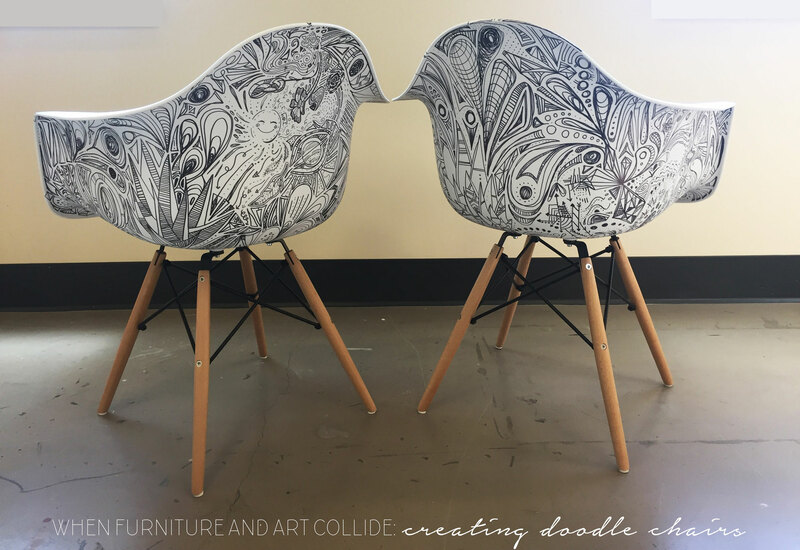 I had tried a number of projects in the past from centerpieces to wall hangings, and was never satisfied with a project, until the doodle chairs. While brainstorming with a coworker and the art gala liaison, someone suggested a piece of furniture as an art item. We did research and found some examples of doodle chairs. I was immediately hooked, this was going to be fun and create a very successful final product. The parent organization that plans the gala provided the chairs and we set to decorating them. These same chairs can be found at Home Depot. I did a a lot of experimenting before getting to work. 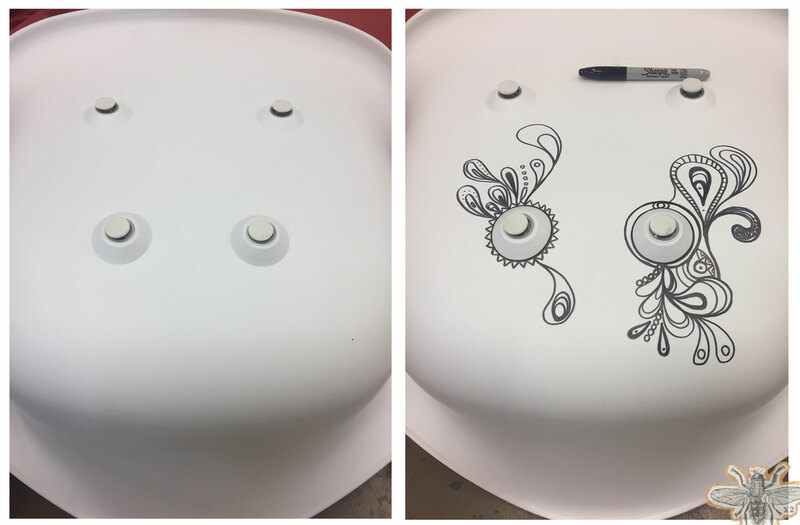 I was hoping to find a way to draw the doodles with sharpie, then spray the chair to help protect the drawing. I tried at least 6 different spray coat products and every single one peeled off of the plastic finish. In the end I decided to keep the doodle mostly on the back of the chair, where sitting would not rub the doodles. I left the legs off while we doodled to make it easier to access the bottom. I set the two chairs on a table in the back of my classroom and whenever students finished an assignment early or needed a break, they would doodle. 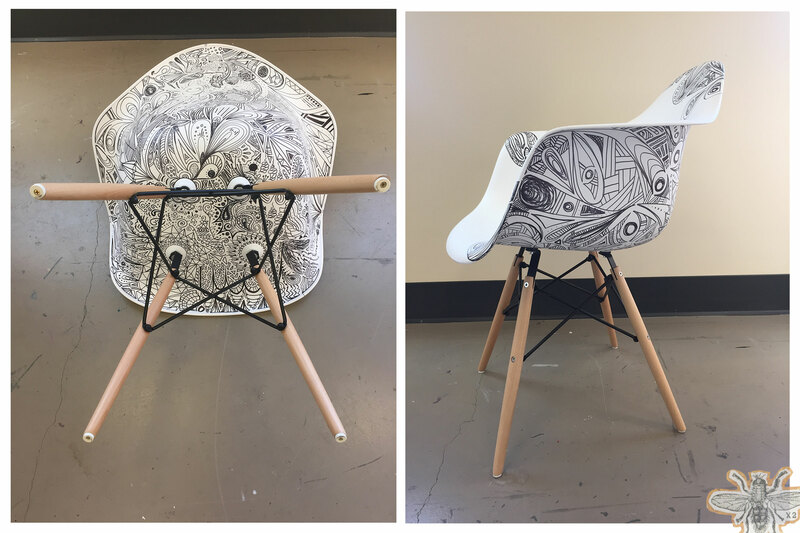 I started the design on one chair so my students would have an example to get started, but then I mostly let them run with it. My students covered the back and bottom of the chairs and I decided to wrap part of the design onto the front. I kept it minimal in hopes that it wouldn’t rub off after a lot of use. The final product was beautiful. I loved the contrast in the design and the modern look. I was sad to pass these onto the auction, but glad my class was able to help. If you are looking for an art fundraiser, this could be a great way to go. You could ask for donations from parents to purchase the chairs or you could find wooden chairs at Goodwill or similar to paint white with acrylic paint or chalk paint, then add the sharpie design on top. I hope these chairs are being loved and enjoyed in a happy home! 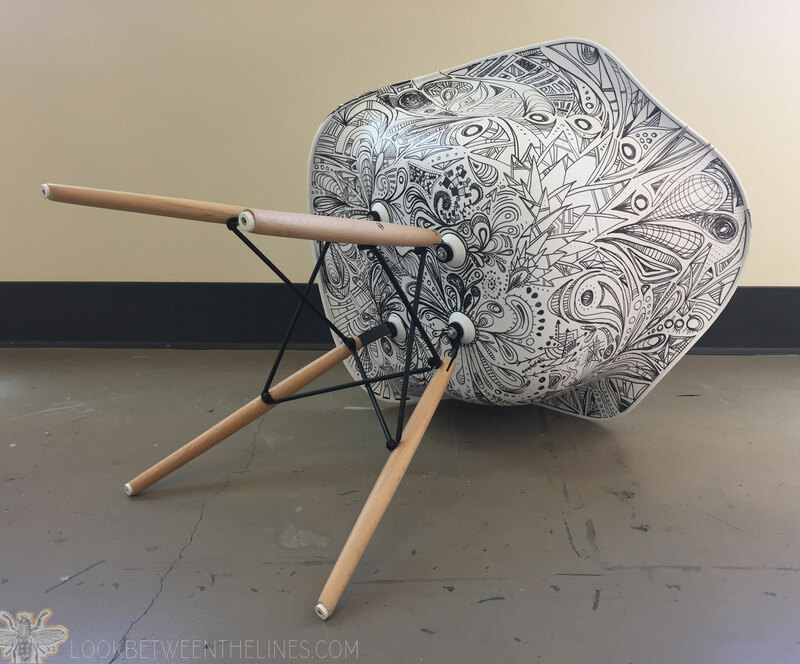 I am very tempted to purchase another pair to create a doodle chair set in my classroom. Thanks for taking the time to check out my blog! Interested in other crafty projects? Check out what else I have worked on here. 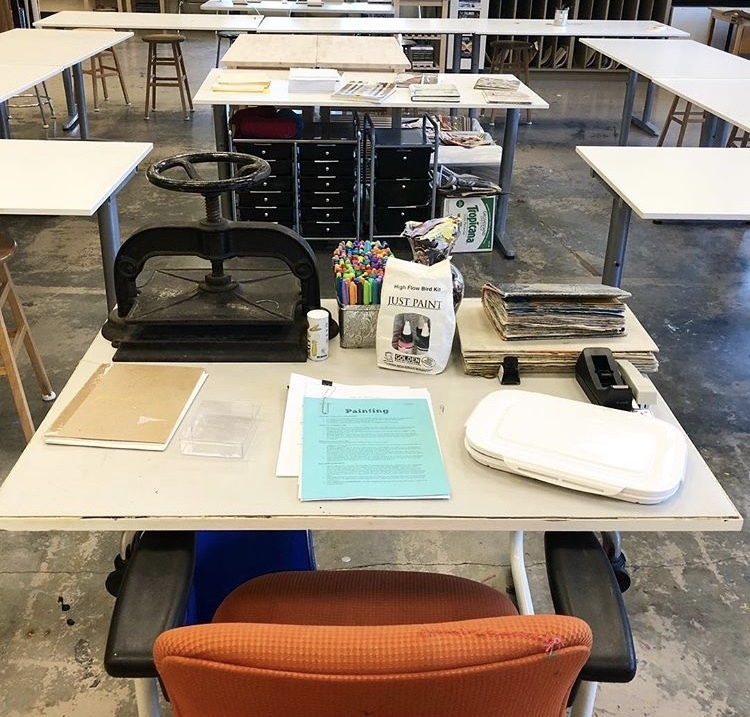 Looking for art lesson ideas? Check out my posts here. Thanks for stopping by! Looking at this visual journal page immediately takes me back to my commute to my first job. My first art position was at a high school outside of Atlanta. I drove 40 minutes straight east everyday until I hit the small town where I worked. It was a very boring drive, straight highway lined with trees. But many mornings in the fall and spring brought beautiful fog that rolled through the trees, making me forget that I was speeding along a highway. I loved seeing it, and it brought a odd combination of comfort and eeriness watching the white, translucent fog moving through the silhouetted trees. It brought be a sense of calm before I started my crazy, jam-packed day. 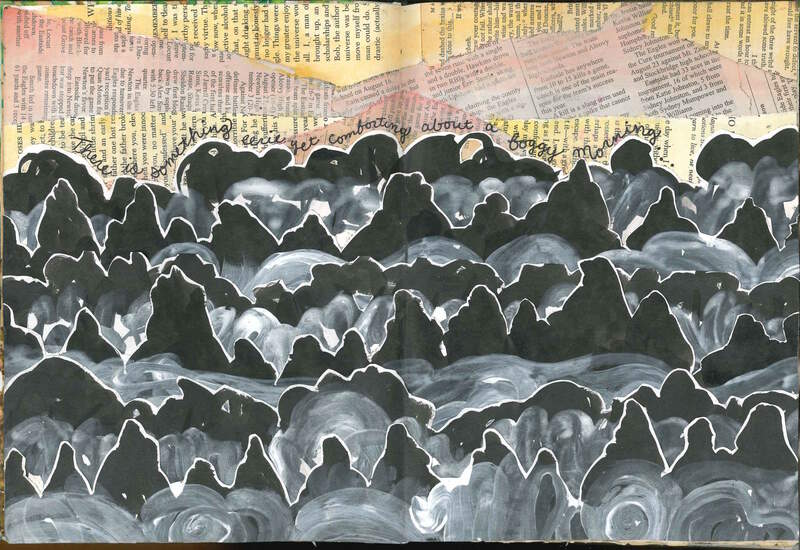 To create this visual journal page, I worked in sections. I first started in my book by gluing down ripped up strips of newspaper and book pages. I then painted the background using warm colors to mimic the look of a sunrise. While waiting for the background to dry, I used India ink to paint treetop silhouettes on a separate sheet of white paper. I using heavier paper, because India ink can easily saturate printer paper and cause it to ripple and tear. I set that aside and waited for it to dry. TIP: Use a hair dryer to speed up the process! Once the tree tops were dry, I used watered down gesso to loosely paint fog. I painted the gesso in spirals, circles, and waves to try to mimic the look. Once the fog and trees dried, I cut them out using scissors. When collaging, I like the look of leaving an edge around objects I cut out. I think it emphasizes the fact that it’s a collage. Once the trees were cut out, I cut them down to fit in the book before gluing them in. TIP: Use a credit card to push pieces into the crease of the book. Recreate a moment when you were in the car. It can be a commute, road trip, or similar! Have fun and good luck! 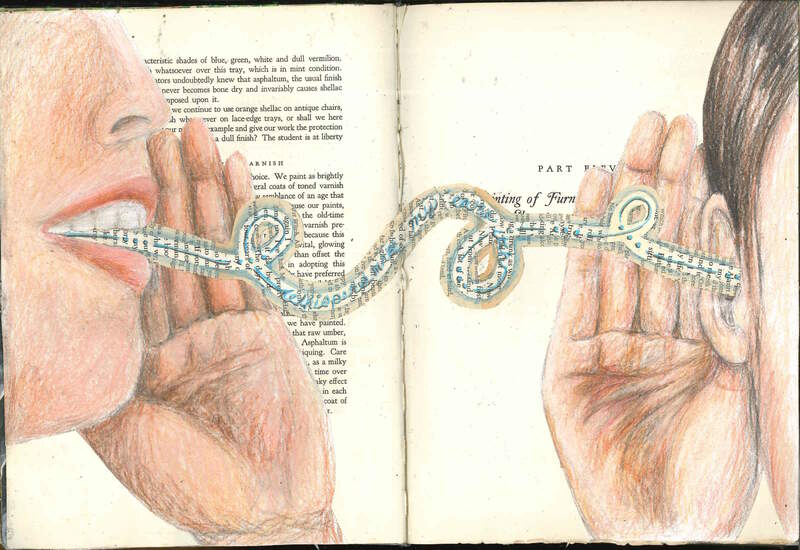 This visual journal page is about the day my husband buried his wedding ring. I have heard many ways people have lost their wedding rings. Leaving it on the bathroom sink and it slipping down the drain, pulling it off in a pair of gloves and accidentally throwing it away. But, until my own personal experience, I had never heard of someone losing their ring because they accidentally buried it. Yes, my husband buried the physical representation of our eternal love in our backyard. My husband is a fidgeter. He drums his fingers on any flat surface, wiggles his foot, he is in constant motion. One of his favorite fidgeting pastimes is taking off his ring and spinning it on table tops. So naturally, one afternoon when he suddenly couldn’t find his ring, my assumption was he took it off and left it somewhere without realizing it. We walked through his day, where he had been, what he did, when he last remembered having his ring. We searched the house from top to bottom, under furniture, on tables tops, in every nook and cranny. We came up empty handed. When I decided it was time to throw in the towel, it hit Nick. He spent all morning planting plants in the backyard, surely it fell off while he was doing yard work. I was skeptical it could simply fall off, but Nick was determined. He spent the remainder of the evening searching over our not small backyard. The next day I assumed it was time to start thinking about a replacement, while Nick decided it was time to rent a metal detector. He spent the entire next day combing the yard with headphones on, detector to the ground, listening for beeps and digging to find what was detected. Our adorable Atlanta bungalow was built in 1940. In it’s hey-day East Lake was a happening Atlanta neighborhood. A beautiful lake attracted Atlantians as a vacation spot and break from city life in the late 1800’s. But, as the years passed civil rights swept the nation and white flight began happening in many cities. This caused East Lake’s previous wealthy inhabitants to leave, attracting lower income residents, and creating the racial divide that honestly still persists today. The beautiful lake that once was a public attraction was purchased, gated off, and reserved only for wealthy golfers to play the course that now surrounds it. Like most Atlanta neighborhoods, East Lake became crime ridden, home owners couldn’t afford to keep up their houses, and things took a turn for the worse. However, the last 15 years has brought new life to these Atlanta homes with people moving back into the city who are able to rehab formerly run down homes. This is wonderful for our area, but also puts our older homeowners at risk with rising property taxes. But, that is a whole separate tangent that you don’t want me to get started on. All of this brings me to the fact that from the 1960’s until we purchased the house, our backyard was essentially a trash dump. At a glance you wouldn’t think this. But over the years the rain, wind, and other elements would slowly push the junk just under the top soil. The amount of glass we have found, and still find, over the 8 and a half years we have lived in our house is astonishing. So, as my hopeful hub was searching for his wedding ring every few inches he instead found a random piece of rusted metal, an old oil can, a random tin, an empty soda can. Instead of spending the day searching for his ring, it turned into a day where he uncovered every piece of trash buried in the dirt for the past sixty years. In defeat he returned the metal detector and claimed his ring a lost cause. At the end of the day he walked out back one last time. He admired a row of newly planted bushes and noticed one bush was just a few inches out of line. He reached down and pulled the plant up in order to replant it in line, and as he describes it, his ring popped out of the ground as the plant came out, as if it were a coin in a video game. A day of searching and the use of a high tech device had failed him. What paid off in the end was his OCD. When it came time to create this visual journal page I was excited because I already had a vision in mind. I knew I wanted to emphasize the bush that ate Nick’s ring, and planned all along to create it in watercolor. Once I had an idea for that, I began on the background. I wanted an earthy look, so I pulled old book pages that had a variety of page colors. I ripped them in stripes to create a softer look, and glued them down in vertical lines. Once I had the background set I sketched out the bush shape with pencil before I started with the watercolor. I wanted the leaves to be very bright so I used the wet on wet watercolor technique. I first filled the leaf shapes in with water, then loaded green on my brush before adding it to the water filled leaf shapes. When you add watercolor pigment to water, it will fill the water shape. As long as the area around the shape is dry, it typically won’t extend beyond the limits of the water. Once I had a green base layer I introduced a dark blue at the very edge of each leaf to create a shadow. I repeated the wet on wet technique with the bark on the trunk and roots, although I used less water so the colors wouldn’t blend as much. To fill in the dirt I simply painted dots all around the bush roots, using different shades of brown. I really wanted the ring to stand out, since it is the focus of the story, so I decided to draw it out with colored pencil, so the material would contrast against everything else. I drew it on a separate sheet of paper, filled it in with colored pencil, then cut it out and glued it to the page. I cut sections of the ring out to show the roots painted on the page to make it appear as though the ring was overlapped by the roots. To add the words I wanted to create a space that made sense with the rest of the image, so I drew out and painted a scroll like bar. I painted the same texture at the end of the roll as the bark on the bush, to look like it was being pulled out of the trunk of the bush. I wrote the words using a thin paintbrush and watercolor. Through the years this page has held it’s spot as one of my favorite visual journal pages I have created. I am very happy with the final image and the story behind it is one I will never forget. Create a visual journal page about a piece of jewelry. It can be a sentimental piece, the loss of a piece, or the desire for something. Have fun and good luck! TPT Bonus Back to School Sale! I have been terrible at blogging this summer, surprise, surprise, this reflects no past patterns whatsoever (insert eye roll here). 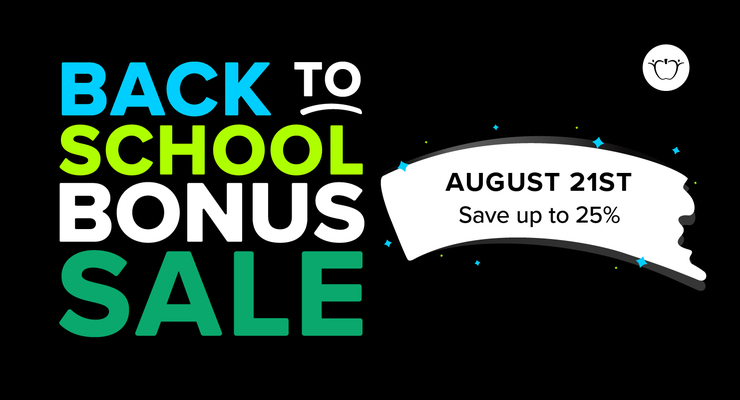 Even though I plan to get back into regular blogging, I wanted to drop a quick note about the Teachers Pay Teachers back to school bonus sale! I just found out this was happening at the end of last week, and I am so excited because I don’t remember participating in a bonus sale in past years. So many schools start back in September, so this a great way to give those teachers a sale day if they weren’t in school mode and back to school shopping at the beginning of August. The bonus sale is one day only, August 21st (2018). My entire store will be 20% off with an additional 5% provided by TPT at checkout. I have still been posting regularly, although not as often as I was over the summer. I am back to school and my time is now spent 90% art teachering and 10% TPTing (with being a mom, wife, dog and chicken mom, and homeowner lumped somewhere in those two). I have been working so hard getting my classroom set up and ready to go. I have done a good bit of clearing out, organizing, and rearranging this year. I plan to post about my classroom transformation soon! 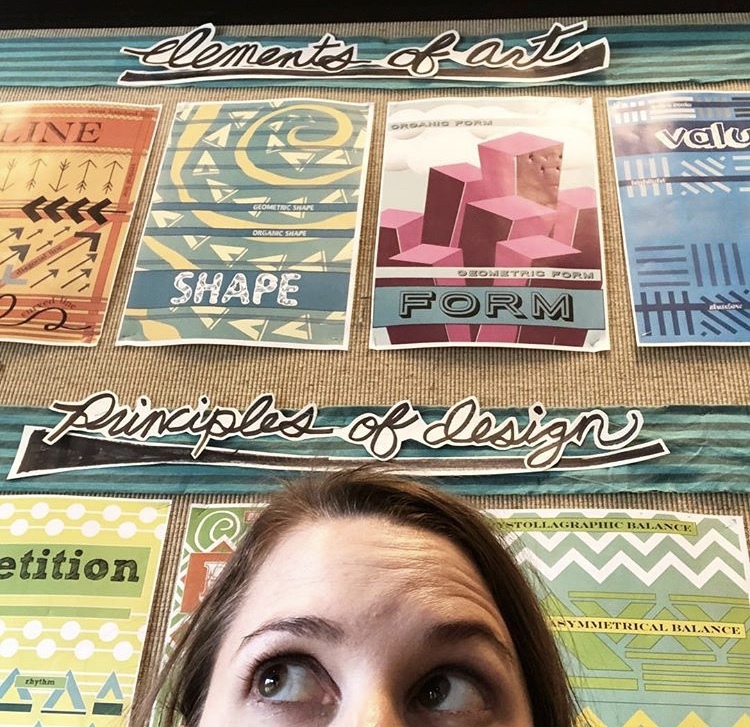 I also reprinted and laminated my elements of art and principles of design posters. These are available at my TPT store and will be included in the 25% off on Tuesday, 8/21. I felt like my life revolved around laminating for a few days. 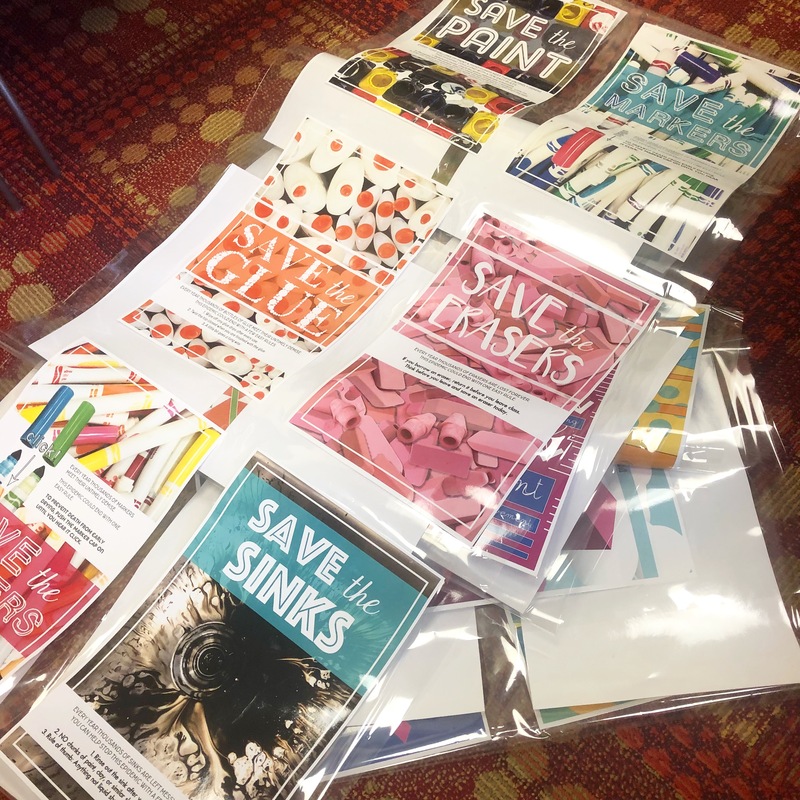 But I also got my brand new “Save the…” poster series laminated and hung. I will be posting pictures to my instagram about these sometime next week. You can find these posters on my TPT store here. If you missed my post recapping all the TPT products I made over the summer and the new bundles I am working towards, read about them in my back to school TPT post here. Happy bonus sale day, make sure you mark your calendar! Thanks for reading this quick note, I look forward to sharing some of my projects more in depth soon. Thanks for stopping by! Thanks to my amazing sponsors who make my blogging life possible! If you would like to have your own advertising space on my blog feel free to email me here.